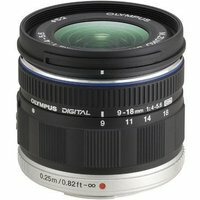 The Olympus 9-18mm f4.0-5.6 M.ZUIKO Digital ED wide-angle zoom (35mm equivalent focal length: 18-32mm) expands the Olympus Micro Four Thirds lens system. Its ultra-compact build, lightweight construction of 155g and a total closed length of 49mm is made possible through the retractable parking mechanism. But it's not just the compact size that surprises - the excellent image quality is equally impressive. With the Olympus 9-18mm lens you can easily create powerful effects of perspective by using it at the wide-end for excellent close-up shooting with a minimum distance of just 15cm from the front of the lens. The lens is also ideal for landscapes, interior and architectural photography.